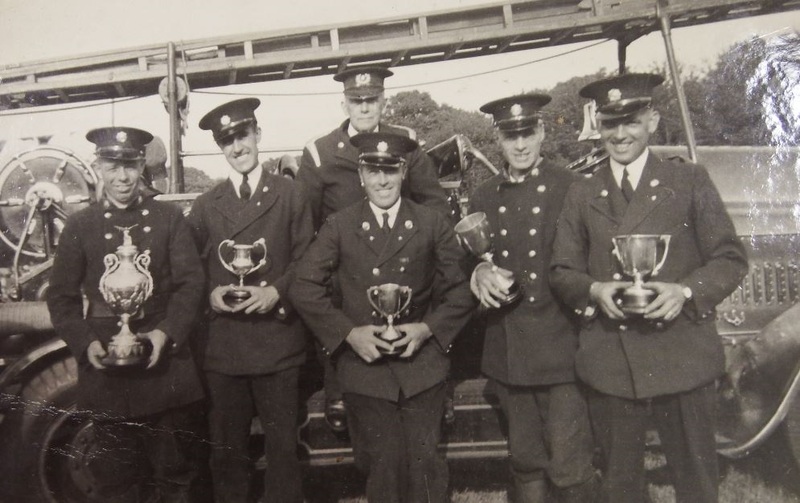 Whilst modern health and safety concerns saw the sad demise of the fire brigade drill competition in the 1980's, the history of Isle of Wight firefighting owes much to the competitions that began in the mid-Victorian era. 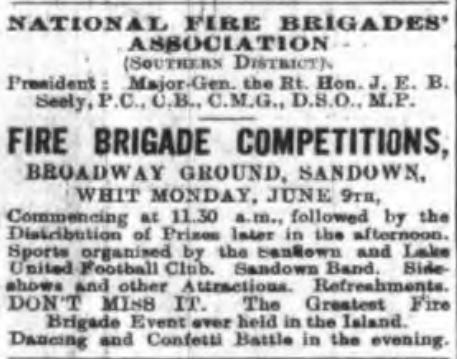 This page features the drill competitions that were specifically for Island based brigades only, although it shouldn't be forgotten that for many Island brigades trips to the mainland to participate, sometimes gloriously, in competitions were an important element of their professional evolution. 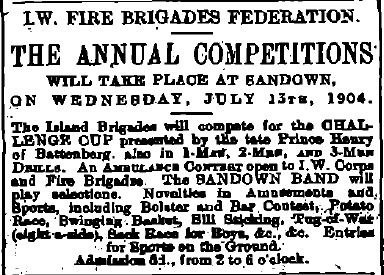 Press reports of the competitions give an impression of great excitement for both the competitors and the crowds that came to watch. 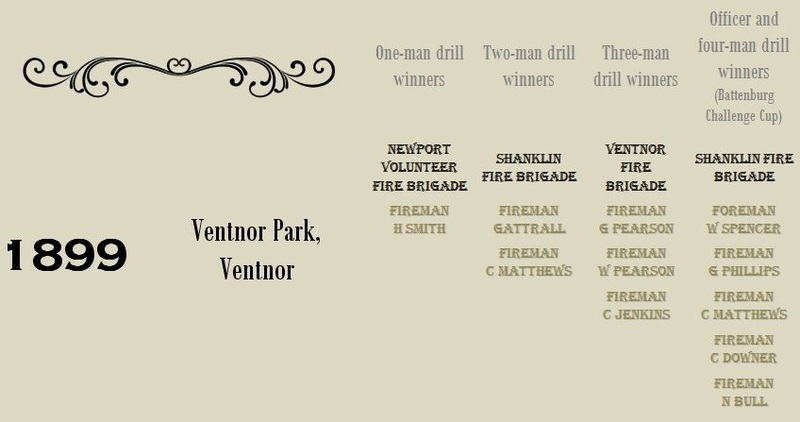 A County Press correspondent claimed that the 1898 IWFBF competition staged in Ventnor was attended by thousands. 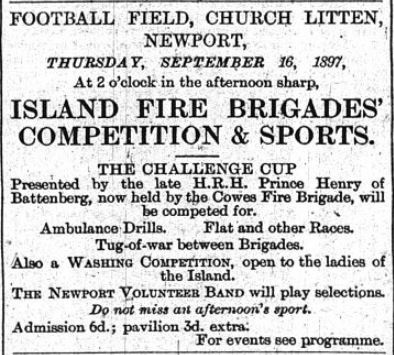 One held in Newport in the same era was so closely fought and action packed that it went on until darkness and had to be finished at a hastily arranged rematch; to which more crowds arrived. 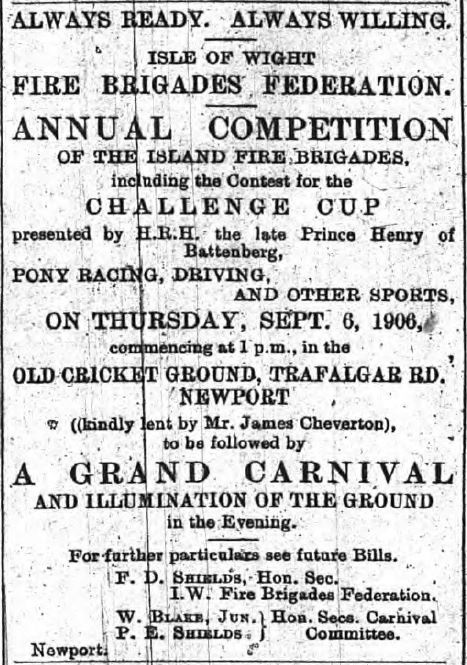 Local nobility supported the events by the donation of glamorous and expensive trophies, most notably that given by Prince Henry of Battenburg whose silverware was enthusiastically battled for long after his death. 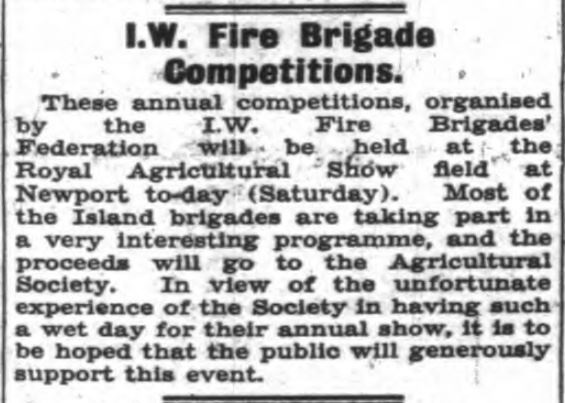 The interest shown by the public saw the events widen in scope with fun elements thrown in such as the competition which involved firemen attempting to be the first to both grip and hold down for one minute a thoroughly oiled and much angered pig. 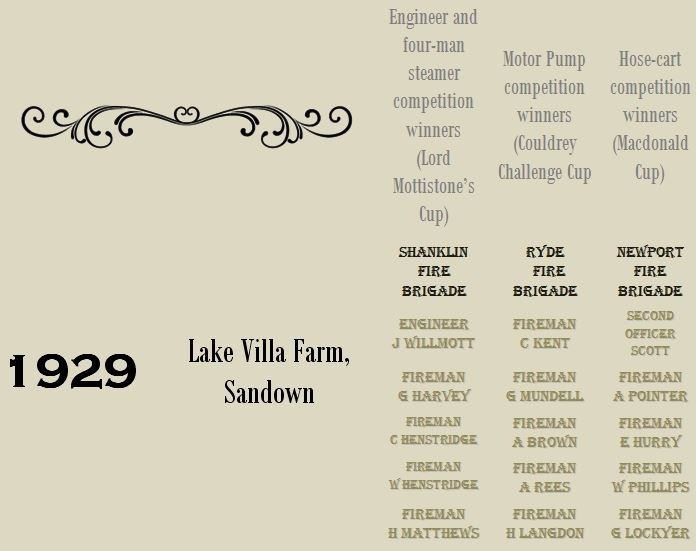 If that sounds inappropriate in today's enlightened era, how about entering your wife in to the washing and drying competition! 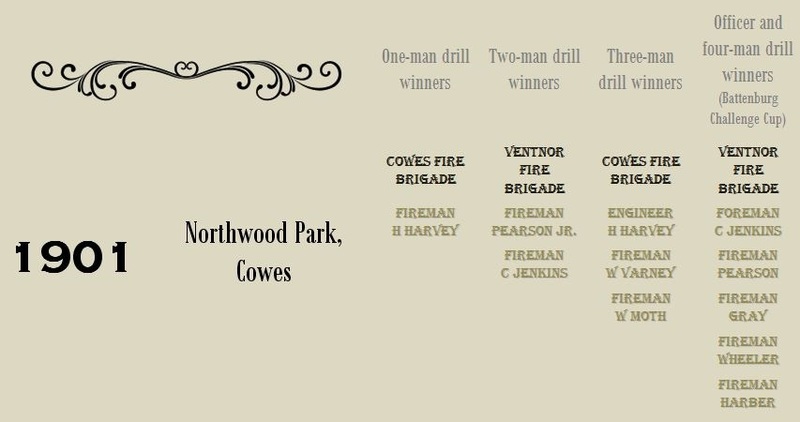 Yes really... and of course it was judged by a man! 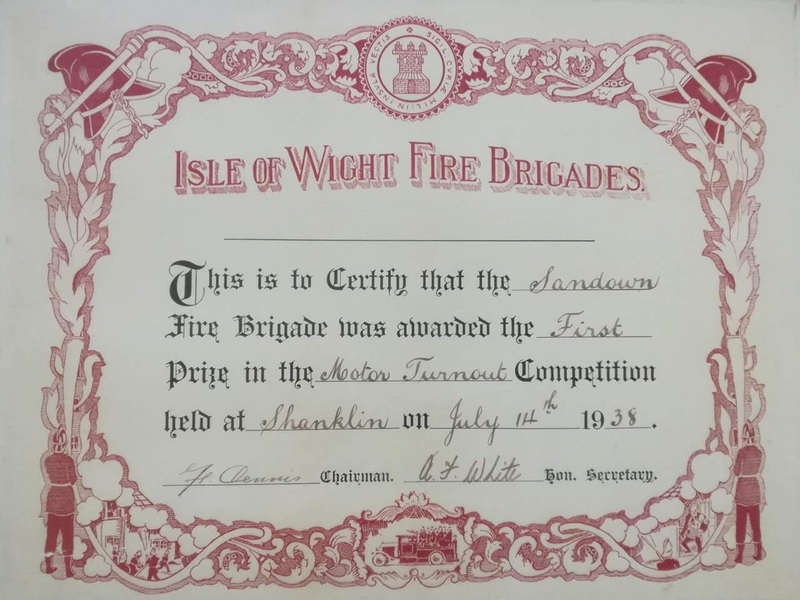 More details of the fun side of IWFBF competitions feature in the books of the Island's firefighting history, this page sticks to the serious business of firefighting for prizes! 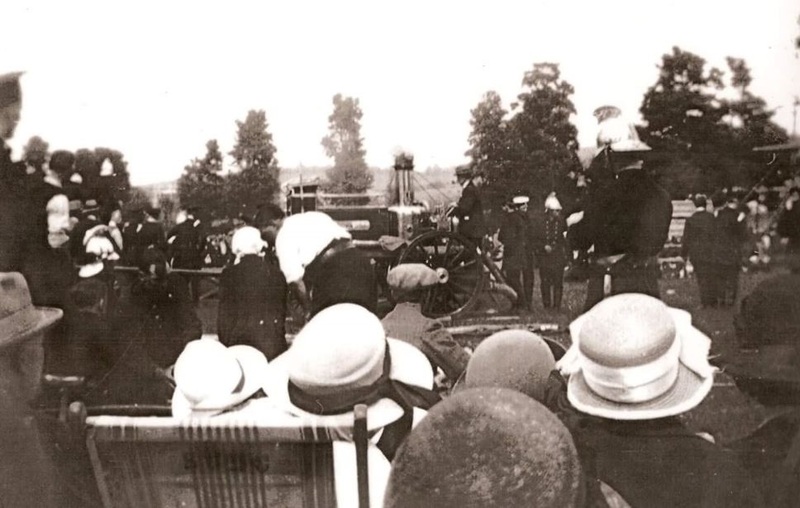 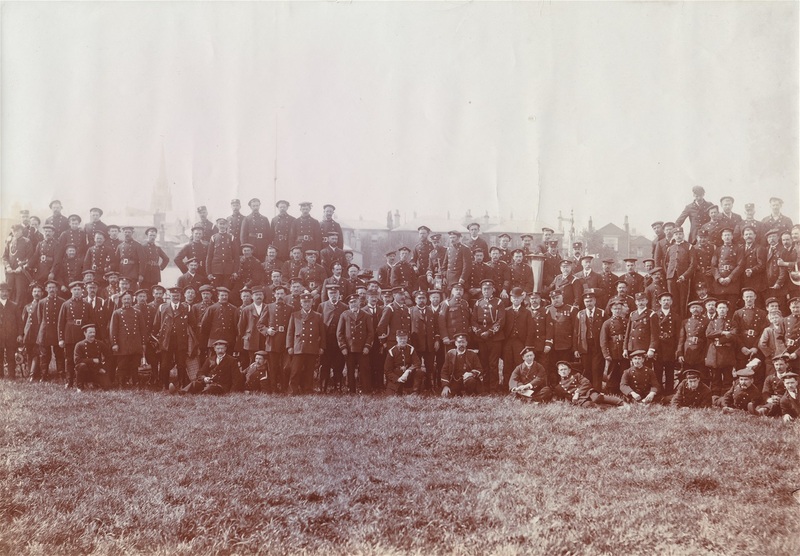 The mass of firemen and officers that gathered at Ryde's Simeon Street Recreation Ground for the Isle of Wight Fire Brigade's Federation competitions of 1903; integrated with the National Fire Brigade's Union, Southern District competitions (which explains the presence of the brass funnel of a steam fire-engine that appears to the right of the image). 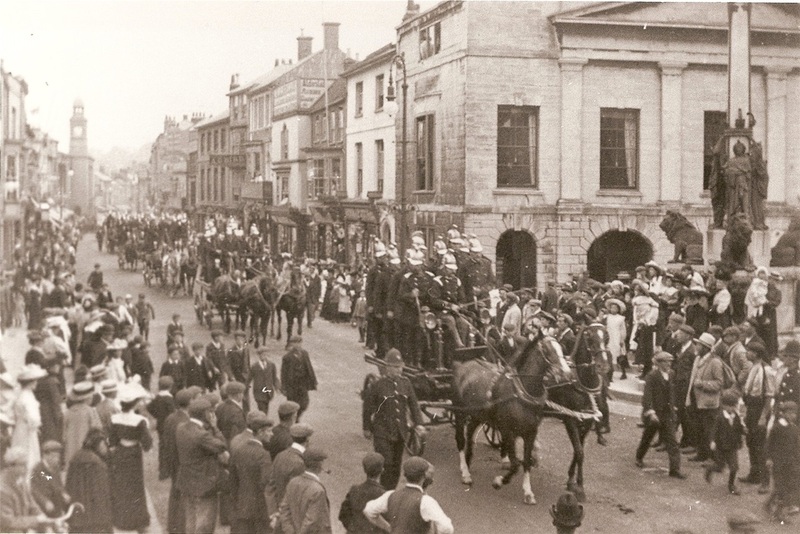 The brigades make their way through Newport to the arena, 1906. 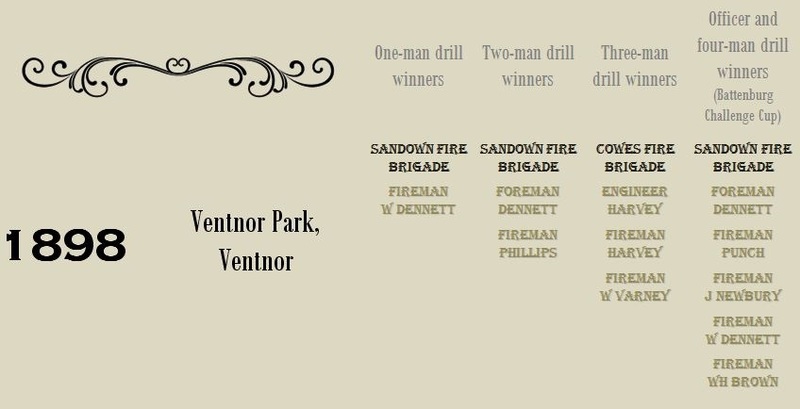 When Ventnor won the Battenburg Challenge Cup for the third time they had the right, under Prince Henry's original rules, to keep it in perpetuity, and they did. 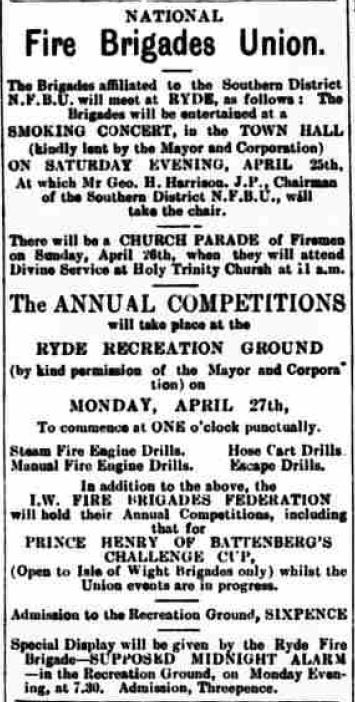 Whether this caused the Federation to lose interest in competitions isn't known, but for sure the IWFBF's events disappeared from the calendar other than a church parade in 1909. 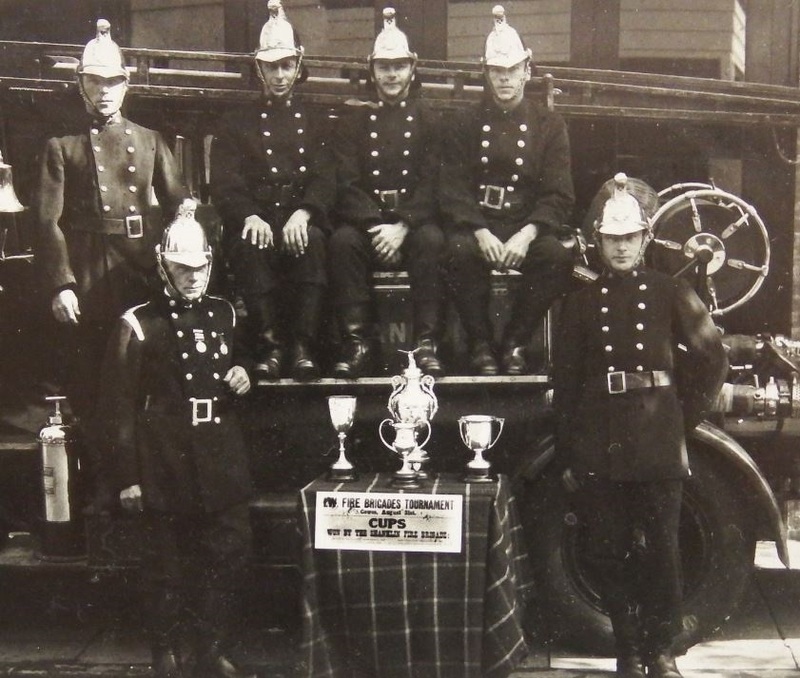 In March 1924 Newport Fire Brigade Captain Nicholas Henry Thomas Mursell was inspired to reawaken the spirit of the Federation. 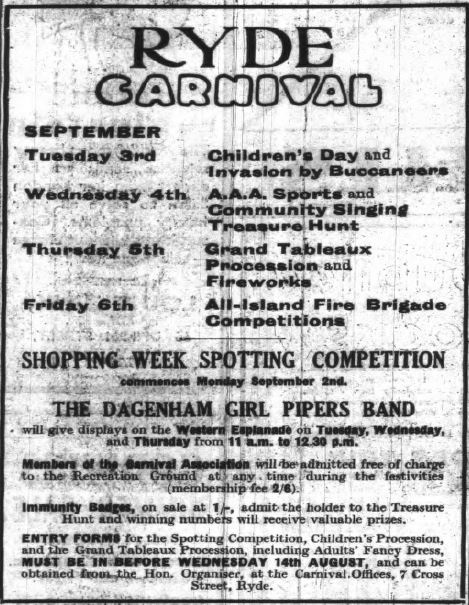 This was partly successful although with a patchy series of competitions until the final one of 1939. 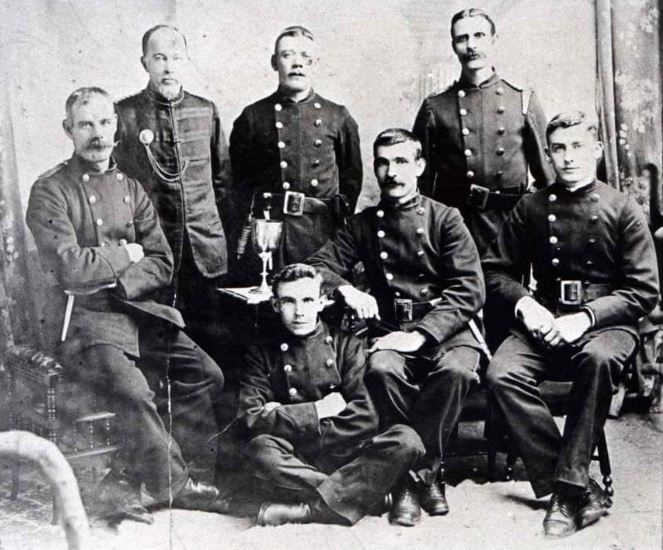 By that stage brigade chief officers had their work cut out training the masses of men being recruited in to the Auxiliary Fire Service for who they suddenly became responsible. 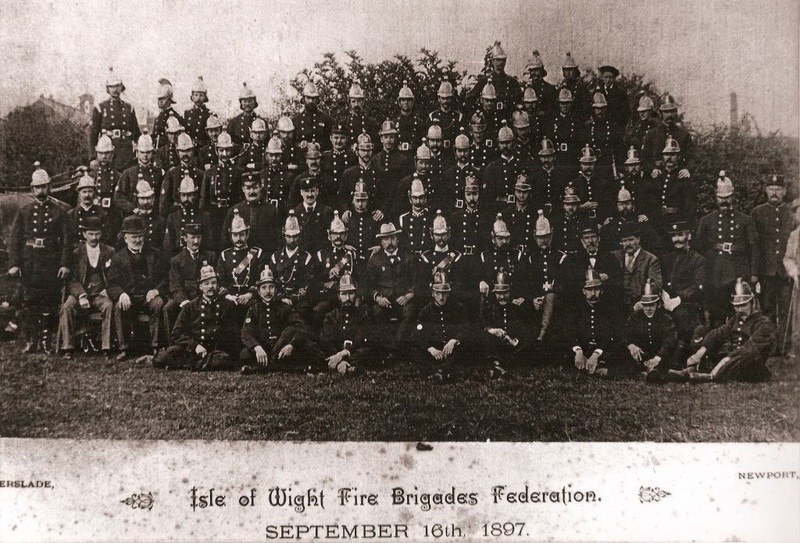 Although these men were never part of the Island's fire brigades per se their presence would have changed the dynamics and time available whilst more pressing issues took priority. 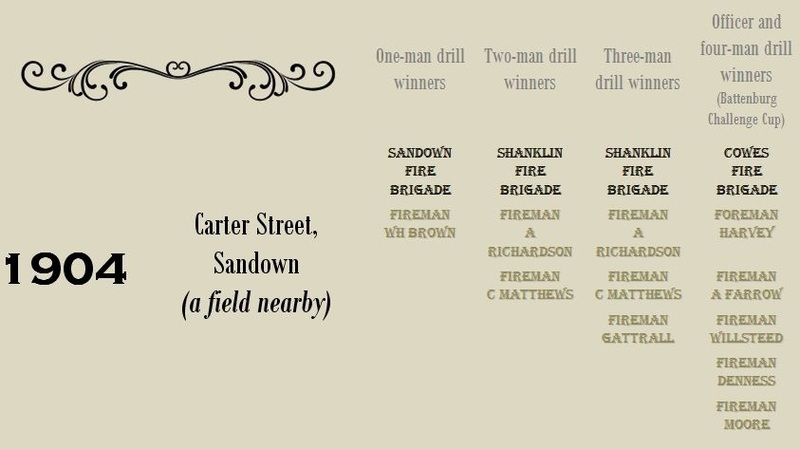 For example in Ryde the Chief Officer Max Heller had a staff of eighteen men before the recruitment of the AFS began in October 1938. 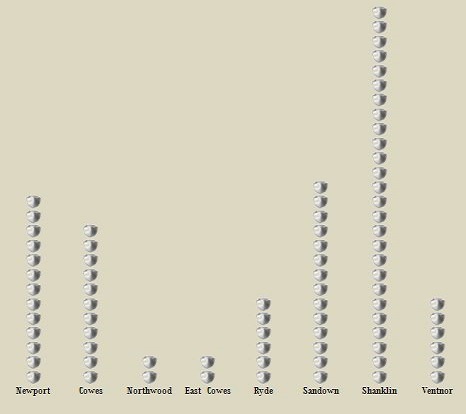 Within twelve months the number he was responsible for had risen to approximately 120. 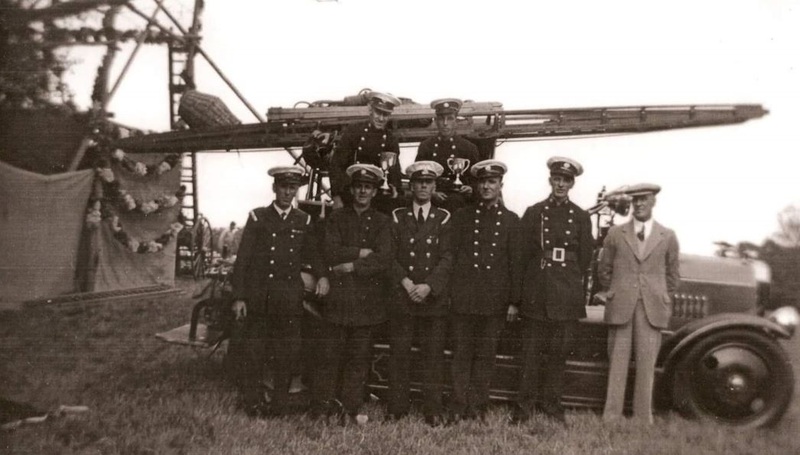 The creation of the National Fire Service in August 1941, in hindsight absolutely the right thing to do to enable the firefighting forces to execute their wartime tasks, saw the death of the brigades which were never to re-emerge, neither did the Federation to which they subscribed. 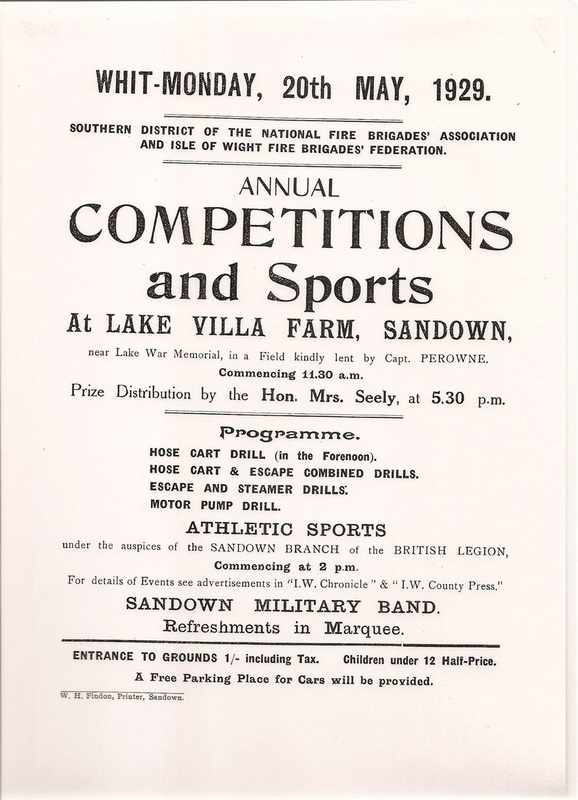 The spectators view of proceedings at the Broadway Ground, Sandown, 1924. 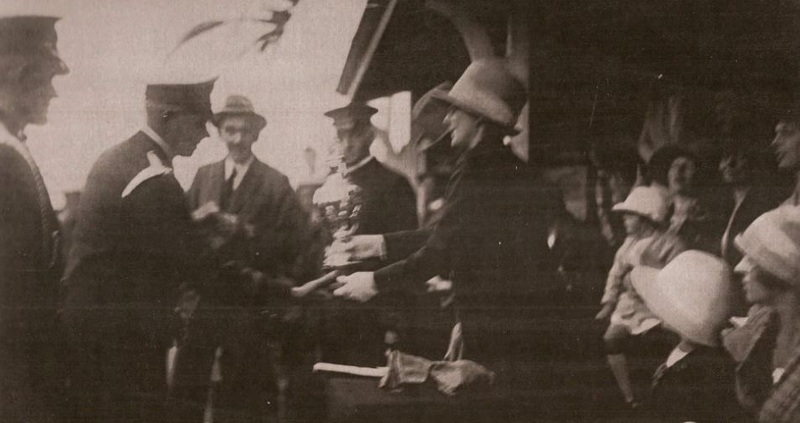 Sandown's Chief Officer Wilfred H.Brown receives the Couldrey Cup after his firemen's success in 1926. 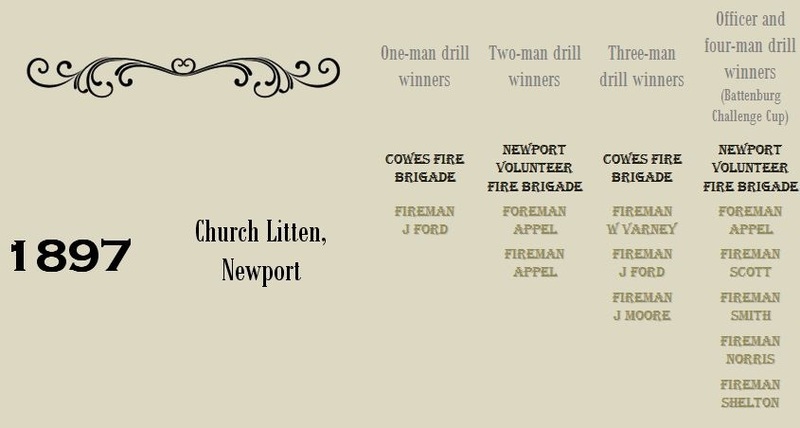 A Newport fireman prepares to run out the hose and branch during the 1926 competition at Church Litten. 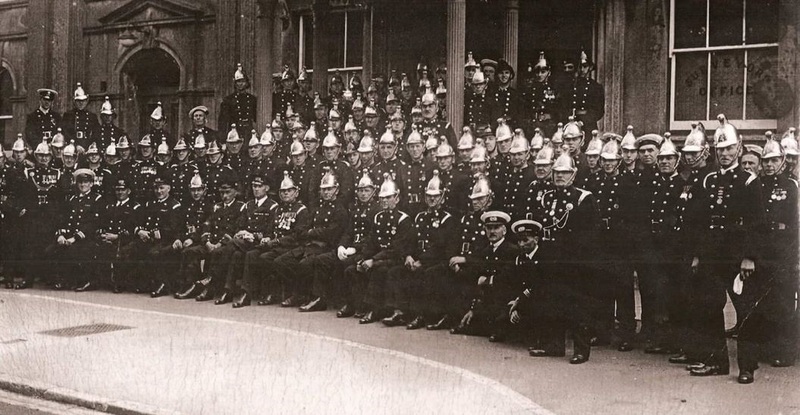 A gathering of brigades of the National Fire Brigades Association including the Isle of Wight Fire Brigades Federation outside Sandown Town Hall before the procession to Lake Villa Farm and the drills of 1929. 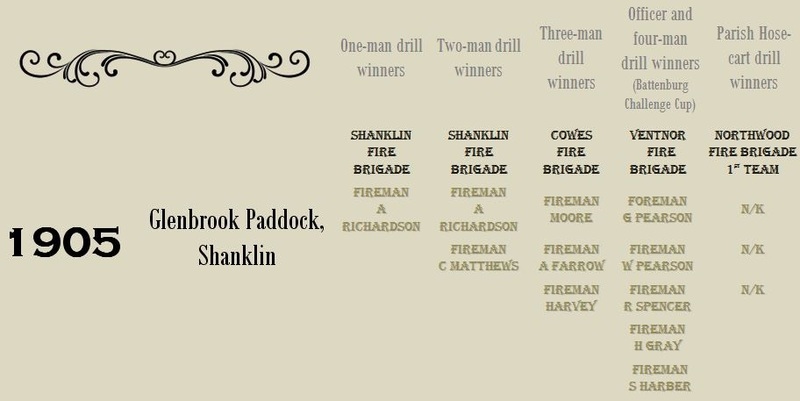 Note; this is not a mistake, Shanklin really did enter the same team in each event and win the lot! 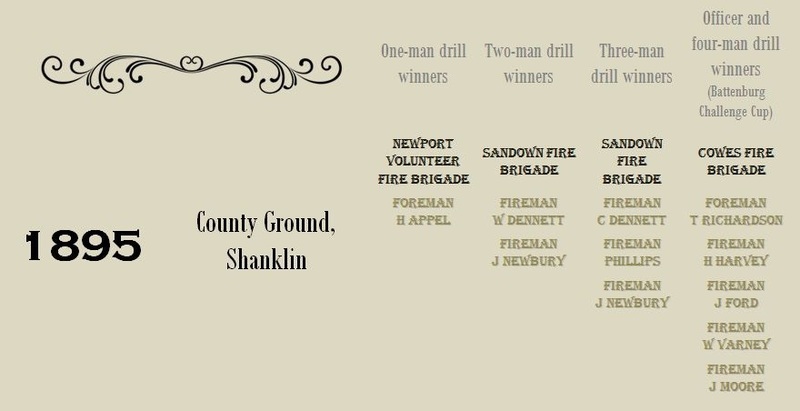 Shanklin's all-conquering team of the 1934 drills with Chief Officer Cecil Charles Matthews to the left of the table. 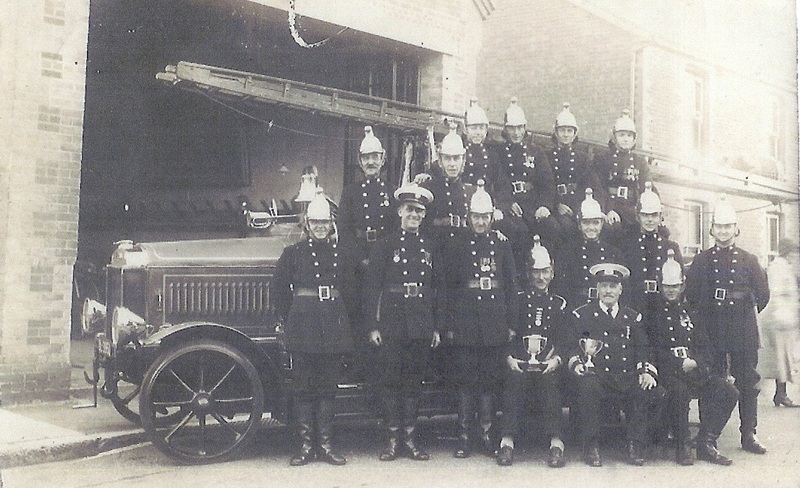 Ryde Fire Brigade pictured in Station Street with the Seely and Margham Cup's won at the 1935 competition. 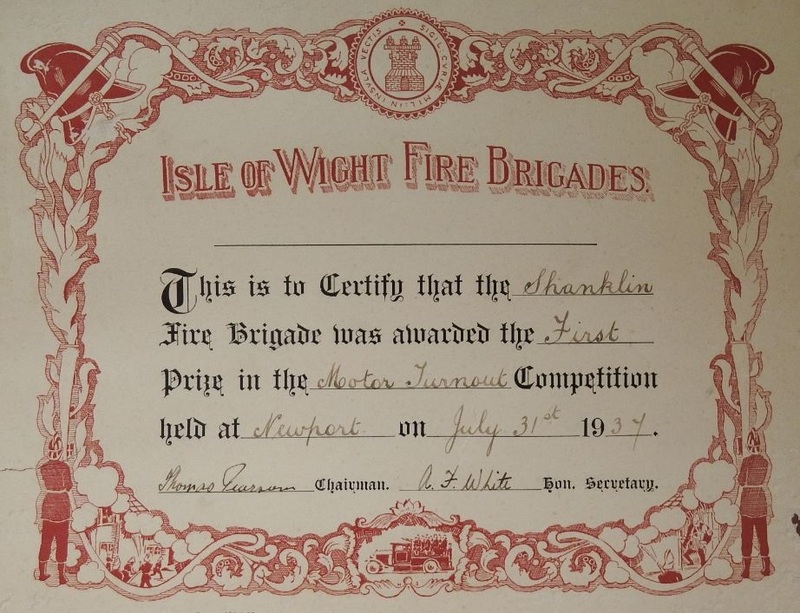 Shanklin Fire Brigade's certificate for their Margham Cup motor turn-out competition win of 1937. Sandown Fire Brigade's 1938 Macdonald and Margham Cup winning firemen; Jack Gray (left) and Fred Lock to the rear and in front from left to right; Bert Holbrook, Wilf Lock, Arthur White, Stan Blackburn and Don Orchard. The Federation certificate awarded to Sandown Fire Brigade for their Margham Cup win in the motor turn-out competition 1938. 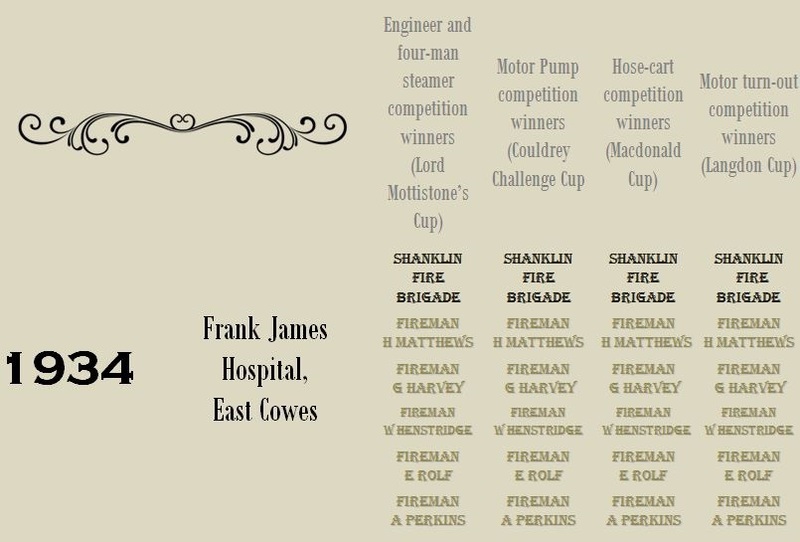 Shanklin's victorious team of 1939 that swept aside allcomers at what was to become the final Federation drill competition. 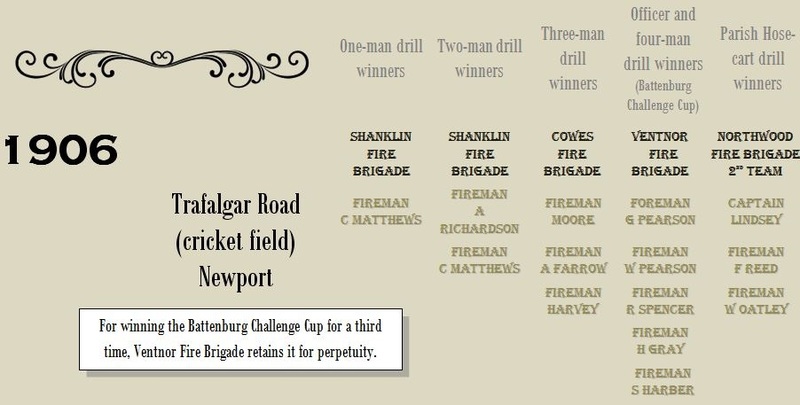 Behind the winning-five is the long serving Chief Officer Cecil Charles Matthews. 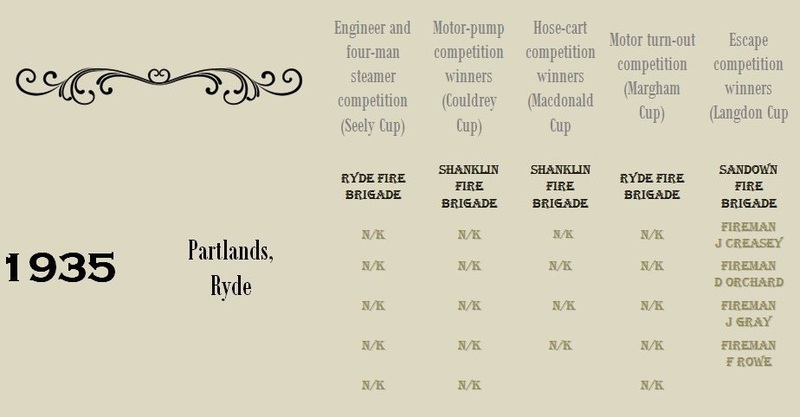 And finally... who was the best overall? 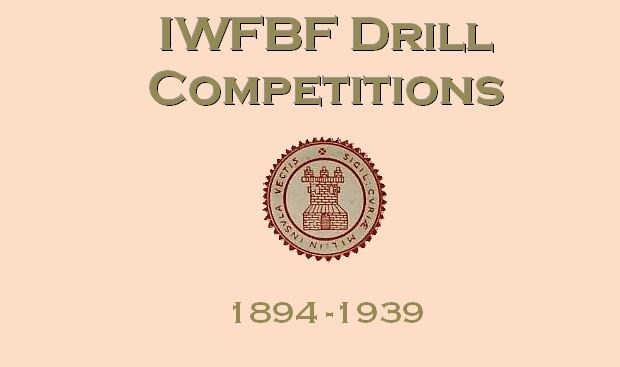 Just for fun... IWFBF drill competition winning comparison 1894-1939. 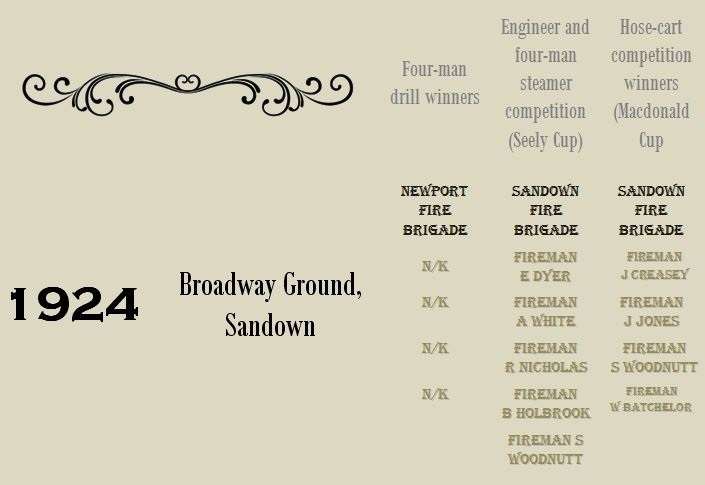 The webmaster wishes to express that the depth of material made available to populate this page of the site owes much to many individuals and organisations including; Isle of Wight County Press, the 2018 staff of Sandown Fire Station, the 2018 staff of Shanklin Fire Station, former Station Officer Geoff Pidgeon (Sandown), David Langdon (great grandson of Captain Charles Langdon, Ryde) and local author Gareth Sprack.